Little Zombies: Infinity and Me: What does infinity mean to you? When I looked up, I shivered. How many stars were in the sky? Maybe the number was as big as infinity. I started to feel very, very small. How could I even think about something as big as infinity?Uma can't help feeling small when she peers up at the night sky. She begins to wonder about infinity. Is infinity a number that grows forever? Is it an endless racetrack? Could infinity be in an ice cream cone? Uma soon finds that the ways to think about this big idea may just be . . . infinite. This book is listed for ages 5-10. Personally I didn't find the book to be amazing for myself, but I did like the author's note at the end. (But the book isn't for me as it's been decades since I was 5.) I would imagine kids don't generally read the author's note and thus my next critique comes into play. It would have been nice if the author could incorporate that the infinity symbol is called a "lemniscate". Because random facts like that are fun and make you feel smart! And you might miss out if you don't read the note at the end! This wasn't one of my favorite math picture books. (Check out Math Curse by Jon Scieszka--it is awesome and funny!) 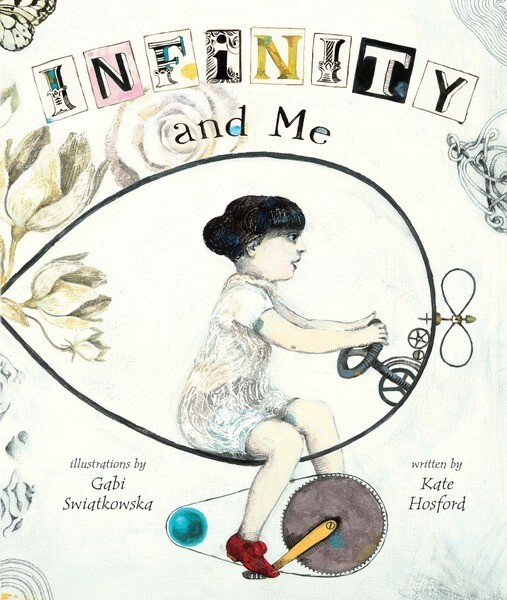 The illustrations of Infinity and Me were fantastic- if you like that kind of illustration. It's beautiful, but not my personal preference. Also-the example with the pasta noodle could be a bit confusing. Since theoretically you can cut it in half forever, but visually it seems finite and could be difficult to comprehend. Rated: 2.5 Bites Between an "it was okay" and "liked it". But I don't see why other people couldn't like it more...it was seriously just personal preference. If I remember, my son said it was fun. And weird.